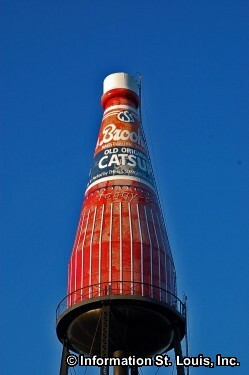 The Brooks Catsup Bottle, located in Collinsville Illinois, is the world's largest Catsup Bottle! This is because it is a 170 foot tall water tower, built in 1949 for the G. S. Suppiger catsup bottling plant which bottled Brooks Catsup. It was saved from demolition and restored in 1995 with funds donated by people from around the world. It was also named to the National Register of Historic Places in 2002. An annual festival is held in July.